SOURCE: Light Waves Concept, Inc.
NEW YORK, NY -- (MARKET WIRE) -- November 22, 2005 -- Premiere Light Emitting Diode manufacturer Light Waves Concept, Inc. recently reported plans to enter into mass production with its LED 3 Watt MR16 prototype. The bulb, which is intended as a replacement for the standard dichroic MR16, is described as the first light emitting diode capable of being used in widespread retrofits for its incandescent predecessor. Light Waves' LED 3 Watt MR16 uses 90% less energy than incandescent MR16s while boasting a near zero heat output and an eight-year lifespan. It produces a light output of around 80 lumens which, according to President Joel Slavis, makes it perfect for architectural applications in the home and office. "MR16 LEDs have become the first true replacement for incandescent bulbs because of the nature of their reflective design," said Slavis from his Manhattan headquarters on Monday. The "MR" stands for the multi-faceted reflectors lining the inside cone of the fixture surrounding the bulb which serve to focus illumination more directly and powerfully onto a desired surface. The brightness-enhancing design serves to circumvent the technology gap in LED luminosity. "These lamps function perfectly in cabinet, counter, display, museum and other task applications while using ten percent of the energy and lasting five to seven times as long as what we had before," explained Slavis. "All the qualities of LEDs -- the absence of heat, the long life -- make the MR16 a perfect replacement with which to begin the LED revolution. This is a benchmark." Light Waves Concept, formerly a track lighting company, began selling LEDs two years ago on its website. 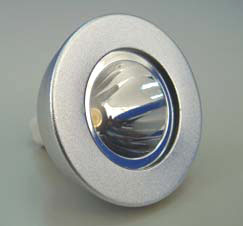 Between then and now the company's LED line has swelled to over 500 models. The company reported a rise in profits of 30% since last year and Slavis said he expects next year to be the same or better. This fall has seen the results of such growth. Light Waves is re-branding its LED line LED Waves, replete with its own website, and Slavis expects to start production from a new factory in Shanghai, China by spring. Currently, the 3 Watt MR16 can be found on Light Waves' internet commerce site, www.lightwavesconcept.com, and Slavis announced he is also in negotiations with several major retail chains to carry the bulbs. About this company Light Waves Concept, Inc.